We did a "Christmas catalog" for the first time during December and it was a wonderful success. To everyone who contributed to Andando during the Christmas season through our gift catalog - Thank you ! Over 150 gifts were given and $6,000 raised! And already most of these gifts have found their way to Africa. We have already begun the new distribution of Micro loans and and farmer loans in Senegal and we have sent funds for the next six months of our feeding program in Buedu. Not only that, we've supplied 600 kids in Sierra Leone with school and medical supplies. 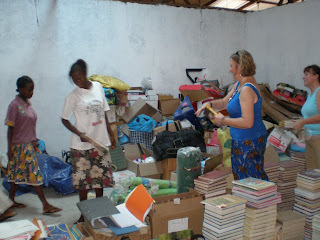 Later in the spring we plan on working on our mosquito net distribution in Senegal, in time for the rainy season there. Thanks again to all of you who participated.